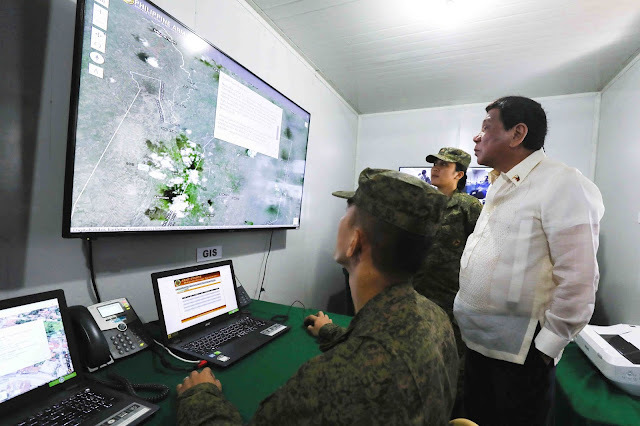 Army spokesperson, Lt. Col. Ramon Zagala, in a statement said Duterte toured the PA's Multi-Purpose Mobile Treatment Facility, which provides a rapid, deployable and operational military facility for mobile battalions when conducting military operations. Zagala said the facility can be transformed into an office, supply room, barracks, and conference room. Duterte also visited the Forward Treatment Facility that provides surgery for ground troops during military operations and advanced trauma care during disaster relief and humanitarian missions. The two facilities can be deployed in areas where there are minimal resources and time constraint, Zagala added. During the anniversary program, Duterte gave recognition to soldiers who displayed courage and gallantry in battle, best performing civilian personnel, CAFGU Active Auxiliary, and Reserve Officers Training Corps cadets. The Distinguished Conduct Star (DCS), the second highest military award in the Armed Forces, was awarded to Sgt. Arnel S. Alberto, Cpl. Roel P. delos Reyes, and Pvt. Jerry N. Wassig for their courage and gallantry as they fought against Maute terrorists in separate encounters. The Gold Cross Medal (GCM), the fourth highest military award, was awarded to 1st Lt. Francis Hernaez, 1st Lt. William S. Hiponia, 1st Lt. Antonio M. Cortes Jr., and Staff Sgt. Juljiri M. Abdurajik for their gallantry in action as they fought against New People's Army (NPA) rebels in Compostela Valley, Camarines Sur, Lanao del Sur and Bukidnon, respectively. In its 122 years, the Army has been instrumental in the fight for independence, first through the Revolutionary Army in 1892 against Spanish colonizers, and then as the Commonwealth Army in World War II from 1938 to 1945. The Army also offered military aid to South Korea during the Korean War in the 1950s and helped rebuild war-torn Vietnam in 1966. In recent years, it successfully defended the state against terrorists during the Zamboanga Siege in 2013 and in Marawi in 2017. Prior to the anniversary program, Duterte also led the turnover, unveiling, and blessing of the Marawi Heroes Memorial Monument (Pylon) at the Libingan ng mga Bayani in Taguig City.